I was lucky enough to attend this year's Festival of Speed at Goodwood. I thought I would share my advice having been there. The event is on for four days, Thursday to Sunday. The weekend tickets are more expensive and it's obviously far busier on those days, so bear that in mind. You need to book tickets in advance, you can't buy them on the day either. Check the weather forecast. We had a few showers, which we timed well by being in the woods around the rally stage for, but there aren't too many places to hide from the elements, so if it's going to be sunny, lots of sun cream, loose clothes, hats and water. If it's going to rain, don't scrimp on the wet-weather gear. Equally, don't forget you're going to be lugging whatever you take around all day. You can return to your car, but depending on where you park, that is a long trek, so somewhat impractical. Wear comfortable shoes, because you are going to be doing a lot of walking. The hill climb itself is only 1.16 miles, but the track extends well past it, plus you'll be criss-crossing back and forth and trying to get around the various paddocks. This is another reason to travel light. You may also want to peruse the attractions and decide what you want to see, because you may not get to all of it. Also check the itinerary for when everything is on, no point going up to the rally track during the lunch break. The queues to get into Goodwood are notorious. Being early will help, a little. By early, I mean the car park opens at 6:30 and the gates open at 7:00. That's despite the first event not taking place until roughly 8:45. We got there before 8:00 and still queued, though not too badly. One tip is to find an alternative route in, don't just follow the signs. There are multiple car parks for a start. The car park is free (well, included in your ticket), although you can pay for prestige parking. I say car park, they're all fields, so bear that in mind. If it's wet, you'll want some wellies or boots, plus need to handle driving in churned up mud. If you drive a low car be aware that it's not exactly level. There is some performance car parking in a different location. They publish a list of what cars qualify to apply. That certainly gets you closer, though not sure about flatter. 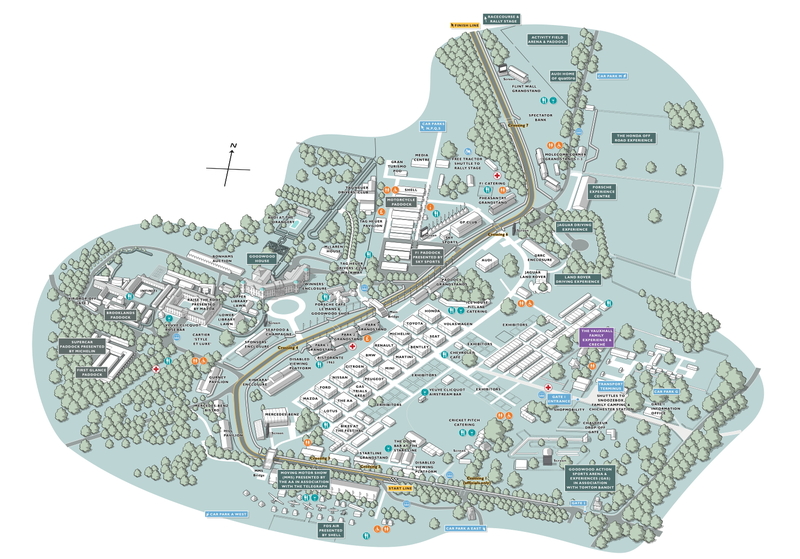 I'm sure there will be other places nearby, outside of Goodwood, and there's a shuttle that runs into Chichester, so you could look at parking there (or catching the train) if you want to avoid the fields. We did some research and found a suggestion of a different car park. It didn't work out for us, we still ended up in car park A (see the bottom of the map), which is a long walk from the event. The recommendation was to use car park E (see the top of the map). If you can find it, hopefully it'll save you both time and more torture to your feet. As I mentioned, the hill climb track runs through the middle of everything, which means you'll find yourself crossing it at various points. There are a couple of bridges, which are always open (just watch out for trials bike riders, who we also saw use them). There are also plenty of crossing points, but these are only open for short intervals between each batch of cars and you can find yourself waiting a long time. You'll want to cross over to the east of the track for various things, but otherwise stay on the west. Also be aware that you can't reach the rally stage up the east side of the track on foot (despite the fact that the tractor shuttle goes that way). They publish a map on the website, which you can print out. They also hand them out inside, and you get one with the programme. As with any event, you're a trapped market. There's nothing to stop you bringing food with you, just be prepared to lug it around. Otherwise, yes, brace yourself for the prices (£6 for a burger, £2.20 for a bottle of pop). It about the same as any other big event, but if there's a few of you it'll add up. There's plenty of choice on what to eat, from the usual fast food to sit down affairs. Obviously you can treat yourself too. One place was offering a Full English breakfast for £22.50. There's cash machines on site and they erected mobile phone masts so coverage was very good. Lots of toilets too. There's even a crèche (apparently). There's tons to see. Everything is built around the hill climb track, which snakes around the lower level before shooting off up the hill. You can view various parts of this and it's what the grandstands are all geared towards. This is the run up the track. Cars are grouped into categories and they travel down to the start line before launching themselves off. They then travel back down the track when all of them have run. Each group goes twice a day, so if you miss them the first time keep a look out for when they run again. At the top of the hill (and it is quite a walk, so be prepared, but they do operate a tractor shuttle up to it) is also where you'll find the start/finish of the rally stage, which snakes through the woods. A large variety of cars go around it, from near-silent Land Rovers to fire-cracking Imprezas. This is where some of the more exciting action was going on, if you prefer your driving on the edge. This is where most of the vehicles are parked when not on the track, though you'll find the supercars elsewhere and some of the older vehicles in the Brooklands paddock. Great to get a close look at everything and, if you time it right, you can see the vehicles leaving or returning from their runs. About as far away from everything as you can get, but obviously a big draw if you want to see some of the most expensive and exclusive cars on the planet. Located near the Brooklands paddock is an area of grass used to show off classic, or at least stylish, cars. Everything from classic Ferraris and Jaguar XJ220s to a collection of Citroen DSs and a Talbot-Lago T150-C-S were all on display. Well worth a look if you like elegant lines. Most, if not all, of the manufacturers have stands of large proportions showing both new and prototype models. Each one is different, with some offering the chance to have a go on simulations, some with TV screens. Many are multi-level and give you good views and some have VIP areas which you can flash your key to get entry too (Audi and Mercedes were apparently, but we didn't try it). These are in addition to the smaller areas in the Moving Motor Show tent. Some of the manufacturers have experiences in addition to their stands. For example, Jaguar/Land Rover and Audi were both offering the chance to go around an off road course in one of their cars. Porsche and Honda were also offering things. We didn't try these but from what I hear you should be prepared to queue. The track is surrounded by hay bales, which can make visibility interesting, especially for the lower cars. We found the section in front of Goodwood House wasn't bad, on either side of the track, but especially on the house side as there's a small rise that gives you a good view down the track towards the first corner. The area in front of the Flint Wall grandstand was also good, giving you a nice view of the cars coming off the corner by the pits (Molecomb Corner), though they do slow down as they approach the treeline (and the wall). Slightly further up is another open piece of track, where they leave the trees briefly, this was also a good spot for uninterrupted views. Up the top you're in the trees and the bales are higher, so you can't see much, the only thing up there is the top paddock where the cars gather before heading back down. There are plenty of grandstands too, which presumably offer the best view, if you're prepared for the price. Some of the exhibitors also have viewing platforms, but they're set back behind the grandstands, so you only really get glimpses. We found the further up the hill we went, the less people there were. The rally track was a lot more open and you can wander alongside it in the woods. We didn't have grandstand tickets, so I can't really comment. They were in all the best places, so possibly worth it if you want an unobstructed view of the action, if the weather isn't great or you want to sit down at some point. As with any racing event, you're only going to get a fleeting glance though, you'll see a lot more of them in the paddocks. If you buy a programme it'll come with an ear piece radio tuned to Goodwood's radio frequency (it was 87.7 when we went). This is broadcasting commentary about the cars as well as announcements about what is going on. So it's useful to stay abreast of things.